Smartphones are expensive — you wouldn’t want to spend hundreds of dollars on one and end up with a scratched screen. Many people still buy screen protectors to protect those screens, but they’ve become less necessary. Screen protectors were once practically mandatory, but advances in glass and coatings have made them unnecessary for most people. You don’t have to buy a screen protector when you get a new phone. There was a time when screen protectors were a good idea, but modern devices have more advanced screen protection built-in. Most smartphones you’ll buy use Corning’s Gorilla Glass. This is a toughened, hard glass with high scratch resistance. Corning has actually been releasing new versions of Gorilla Glass over the years — Gorilla Glass 3 was introduced in 2013 and Corning boasted it was up to 40% more scratch resistant than Gorilla Glass 2. Your smartphone’s screen is already fairly scratch resistant — assuming you have a recent smartphone and not one that is five years old. If you’re already using a screen protector, you may see a scratch or two on your screen protector and think it’s doing a good job. This isn’t necessarily true — materials that would scratch a plastic screen protector won’t necessarily scratch your phone’s glass screen. Even the keys in your pocket shouldn’t be able to scratch a modern Gorilla Glass display. Gorilla Glass is harder than the metal used in keys, coins, and other common household metal items. Take keys or even a household knife to a modern smartphone’s Gorilla Glass display and you shouldn’t see any scratches — you’ll find plenty of videos of people attempting to scratch their screens with knives on YouTube. Screen protectors change the experience of using your smartphone’s touch screen — they may seem softer or more grippy. Placing another sheet of plastic between you and the screen will change how your device’s screen looks, especially if the screen protector discolors over time. 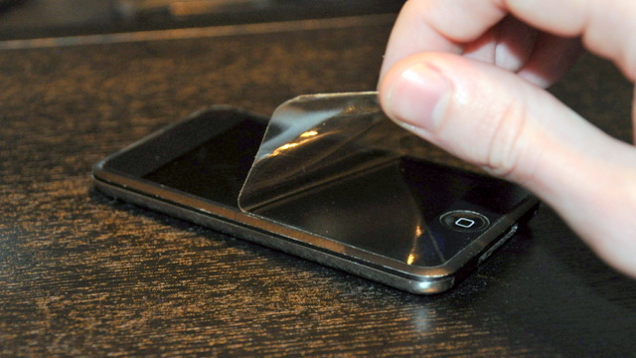 A screen protector may pick up unsightly scratches that wouldn’t have actually scratched your smartphone’s screen. This is all assuming you apply the screen protector properly — if you’re not careful, you may end up with bubbles and cracks under your screen protector and you may have to apply a new one. So, When Do You Need a Screen Protector? Some common materials can scratch Gorilla Glass. The biggest culprit is sand — if you go to the beach and end up with some sand in your pocket, that sand can rub against your smartphone’s glass screen and scratch it. Hard rocks work similarly — if you drop your smartphone on the ground and it skids along concrete or rocks, there’s a good chance its display will be scratched (among other damage). Other types of glass, rare metals, and very-hard materials like diamonds can also scratch a Gorilla Glass screen. So, if you spend a lot of time at the beach, you might want a screen protector anyway. Screen protectors also boast anti-fingerprint coatings, but modern smartphones have “oleophobic” coatings that repel the oil on your fingers, reducing unsightly fingerprints. Even if you have fingerprints building up, you just need to give the screen a quick wipe — ideally with a microfiber cloth. Screen protectors aren’t a must-buy item anymore. You can safely use a modern smartphone with a “naked” screen, and — even if you put it in the same pocket with your keys and coins — it should be fine. Of course, you’ll probably want to keep your keys and coins in another pocket — there’s a chance they could scratch some other part of your phone. Corning’s proprietary fusion manufacturing process is at the core of our leadership in glass technology and the cover glass industry. This extraordinarily precise, highly automated draw process produces a thin sheet cover glass with pristine surface quality, outstanding optical clarity and inherent dimensional stability – qualities essential for cover glass for consumer applications. The process begins when raw materials are blended into a glass composition, which is melted and conditioned. The molten glass is fed into a trough called an “isopipe,” overfilling until the glass flows evenly over both sides. It then rejoins, or fuses, at the bottom, where it is drawn down to form a continuous sheet of flat glass that is so thin it is measured in microns. The glass is untouched by human hands or anything else that will introduce flaws into the surface. This same fusion process is at the heart of Corning’s industry-leading LCD glass. The composition of Corning® Gorilla® Glass enables a deep layer of chemical strengthening through an ion-exchange process where individual glass parts are cut from the “mother sheet” and undergo an ion-exchange process. Ion exchange is a chemical strengthening process where large ions are “stuffed” into the glass surface, creating a state of compression. Gorilla Glass is specially designed to maximize this behavior. The glass is placed in a hot bath of molten salt at a temperature of approximately 400 degrees C. Smaller sodium ions leave the glass, and larger potassium ions from the salt bath replace them. These large ions take up more room and are pressed together when the glass cools, producing a layer of compressive stress on the surface of the glass. Gorilla Glass’ composition enables the potassium ions to diffuse far into the surface, creating high compressive stress deep into the glass. This layer of compression creates the surface that is more resistant to damage. Corning’s innovations don’t end on the manufacturing floor. One of Corning's greatest strengths is our focus on developing the technology behind the glass. Our research has delivered such life-changing innovations as the glass envelope for Edison's light bulb, the glass envelope for cathode ray picture tubes (CRTs) and liquid crystal displays (LCDs), as well as the first low-loss optical fiber capable of use in telecommunications. We continue to investigate new glass compositions and process innovations at our three major research facilities: Sullivan Park in Corning New York; Corning Technology Center in Shizuoka Japan; Corning Research Center Taiwan in Hsinchu, Taiwan. Scientists in these facilities work closely with the Gorilla Glass commercial, engineering, and manufacturing staff to anticipate industry trends and deliver new or improved glass technologies that add value to customers’ products and processes. Through this ongoing process, Corning Gorilla Glass continues to lead through glass technology innovation in the fast-paced consumer electronics industry.